“Performance for the price” is another way of saying “bang for your buck.” When you pay the same amount of money, but you get much better performance, then you are getting higher performance/price. If you’re building a gaming rig, it really saves you money to build your own. Pre-built retailers charge absurd prices for any product they sell with the word “gaming” in it, even if their version of a gaming computer is just one of their usual machines with an added graphics card and a slick-looking case. You can easily find a better budget gpu and cheaper case if you build your own gaming PC. By building your own PC, you’ll get high-grade hardware for half or even one-third of the price the equivalent would cost in a pre-built. 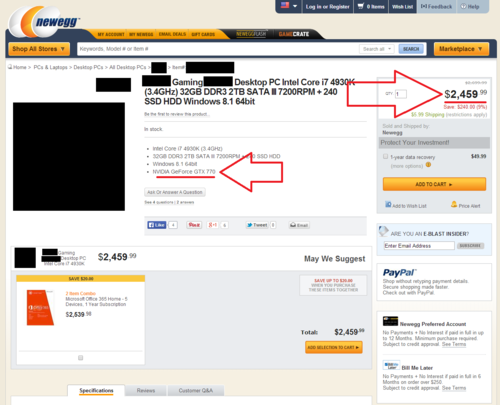 For example, the GTX 770 is recommended for our Excellent tier, priced at ~$1,000. It can also be found in some ~$2400 pre-builts. Don’t fall for the sales pitch on these machines even though it is the best gaming pc under $ 1000: Build your own. Save your wallet. An example of poor gaming performance for the price. The GTX 770 can be found in Logical Increments ~$1,000 tier, while a pre-built with the same GPU retails for $2,459. Names censored to protect the guilty. The components inside pre-built computers are not made to last. They are made to be cheap – and I mean “cheap” in the most insulting sense of the word. Important hardware such as power supplies, motherboards, and hard drives are often bottom-of-the-barrel, bulk-purchased, off-brand stuff that will start to show signs of age in under two years. The reason that pre-built PCs use cheap components is to save costs, but these savings are not passed on to the customer. Instead, you get a low-end PSU (more likely to fail, burn, or even explode), a low-end motherboard (significantly more likely to fail over time), a cheap case (often with just a single fan and no cable management options), a stock heatsink for the CPU, and so on. With such low-quality components, your pre-built PC is highly likely to fail within a couple of years, forcing you to buy another. Conversely, parts you buy yourself from trusted brands can (and almost certainly will) run a much longer time with fewer hardware-related failures. Thus, you get to save money when you build your own PC, and that PC will last longer for it. This ~$1,000 pre-built PC has a low-quality power supply, a low-end motherboard, and a low-airflow case with a single small fan. When you build your own PC, you can choose a decent case. Even the cheap cases come with cable management options, and with several places to add fans later. This means that you can tuck away the PSU cables so that they do not impede airflow, and you can add more fans later for increased cooling. If you buy a mid-tier case, then you typically get 2 or 3 fans, or even more with high-end. Having good airflow, a good heatsink for the CPU, and a graphics card with a good cooler means that all your components will be cooled well. That means they’ll live longer. The above is in stark contrast with the cooling you get in a pre-built. One great reason to loathe pre-built computers is their miserable airflow inside the case: The cases are typically cramped, have no cable management options, come with only a single exhaust fan, and no extra brackets or slots for you to add more fans. This means that airflow inside pre-built cases is limited, which leads to overheating. In turn, overheating leads to quick hardware degradation. (A very general rule of thumb: Every 10C increase in average operating temperature leads to the lifetime of the device being cut in half). Pre-builts are designed for quick assembly-line production, not end-user efficiency, dependability, or tinkering. Pop open a decommissioned pre-built tower case sometime to get a firsthand lesson on this – notice how every component, from the power supply to the CPU fan, is crowded next to the parts around it? 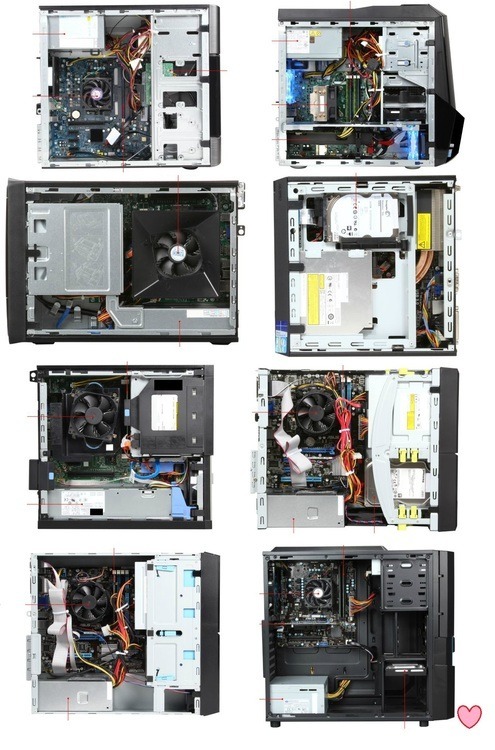 The picture below shows eight pre-built internals: seven typical ones, and one that actually gets it right. Seven pre-builts PCs, with spaghetti cables impeding airflow, extremely crowded internals, or with stock coolers – often with all three for maximum overheating. On the bottom right we show one neat pre-built for comparison. Pre-built PCs typically come with a one-year warranty, and that warranty covers the entire PC. This means that if any part of your pre-built breaks or malfunctions, you have to send the entire PC back. If you buy the components individually, you will find that they typically come with two- or three-year warranties. Quality items can come with five- or seven-year warranties, and RAM typically has a lifetime warranty. More importantly, if something breaks, you send that particular piece back, not your whole computer. HAF 912. Typical case. two-year warranty. i5 4690K. Typical CPU. three-year warranty. Rosewill Capstone 650W. Quality power supply. Seven-year warranty. Crucial 8GB RAM. Standard RAM. Lifetime warranty! And on the pre-built side: Newegg’s “best seller” gaming PCs. As of July 31, 2014, all of them are sold with one-year warranties. These reasons are slightly subjective. While valid, they may not apply equally to everyone. Pre-builts come with cramped cases (often the “slim” form factor), and/or very low-power PSUs. These components aren’t just bad for airflow and stability, they’re also tricky for future upgrading. For example, if you wanted to buy a new graphics card, you will need to make sure that it fits in your pre-built case, and that your PSU can handle it. If your case is too slim, or your PSU is too weak, then you will need to buy a second item, or forget about upgrading. Some pre-builts make it impossible for the end-user to upgrade the RAM or add another hard drive without taking the optical drive out first. Also, it’s considerably easier to upgrade a component later on if you have detailed knowledge of what’s already inside the case – a nice bonus from taking the time to purchase and install each piece yourself. 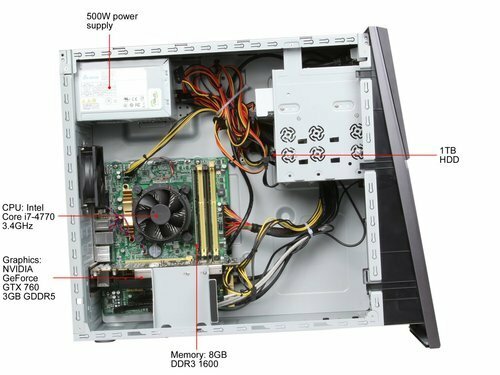 Pre-built PCs often come with a powerful CPU, lots of HDD space, and too much RAM at the cost of a relatively weak graphics card, low-end PSU and motherboard, and an inadequate case. This leads to an unbalanced build, particularly when it comes to gaming performance. All that CPU and RAM power can only do so much when your graphics card is weak. Unbalanced builds produce bottlenecks, where one powerful component is held back because another component is too weak. When you pick your own components and build your PC yourself, you can choose a balanced build without bottlenecks. Building your own PC means you have no manufacturer bloatware, no subscription-based protection suites. Many pre-built computers come loaded down with a ton of software you’d never want to use, including propriety programs designed by the manufacturer to “enhance your user experience” (read: slow your computer down), or antivirus trials that will bother you to pay for the full version after you’ve had the new machine for two months. You wouldn’t buy a car that kept pestering you to purchase an extended warranty. Your computer likewise shouldn’t annoy you. You aren’t tied down to the latest OS. One thing holding a lot of people back from a new computer is the reluctance to adopt Windows 8. Today, retailers sell the vast majority of their new hardware with Windows 8 pre-installed, whether you want it or not. Building your own machine offers the ability to load on your preferred OS – 7 if you’d rather stick with the familiar, 8 if you’re ready to make the jump, or GNU/Linux if that’s your thing. OEM versions (i.e. versions for PC builders) of all current operating systems are available for less than $100, if you know where to look. Do you want a particular PC case? Maybe a different brand of graphics card? A different heatsink and fan for the CPU? A modular PSU? When you build your own PC, you choose everything to be exactly the way you want it, from the hardware options and quality, and down to even the color scheme and choice of lighting. You’ll be able to choose your preferences like Realtek for audio manager, Linux as an OS, ZOTAC for a graphics, etc that you can’t get in pre-made. Some people are OK with the standard hardware you find in pre-builts, and some pre-builts do allow you to make some minor changes. But if you want to customize your computer exactly to your liking, and have access to all hardware options, you just need to build your own. Building your first PC results in a great sense of accomplishment. Rightfully so – it’s a do-it-yourself weekend project that you’re guaranteed to learn a lot from, and you’ll finish the job knowing that you got the most for your money. 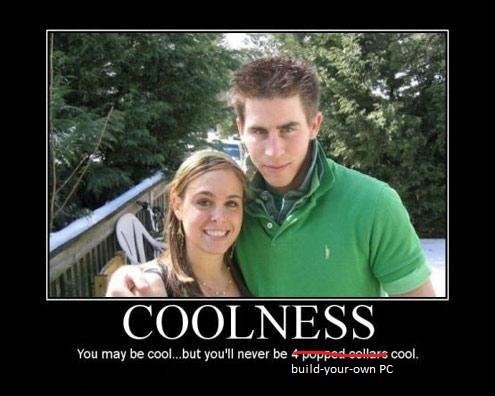 If you are looking for a genuine ego boost, and that feeling you get when you join a semi-exclusive cool club that you can brag about (a lot, and loudly), then you should be building your own PC. This is how it feels to build your own PC. Owning a self-built PC is more fun. Really, it is. The process is full of opening packages, putting things together, and learning what goes where and why and how. You will love your new rig more than you could ever love a store-bought machine, because it takes you beyond mere hardware ownership and bestows hardware familiarity. Having an understanding of your PC’s guts makes troubleshooting easier if something fails. Chances are, everything will go smoothly during your build. If something doesn’t, though, you’ll typically be able to pinpoint the problem and the offending hardware. You no longer have to resign yourself to the catch-all tech support complaint of “my computer is broken” – you’ll speak in specifics instead, because there’s a subliminal free education that comes along with every build you perform yourself, whether it’s your first or just your most recent. There are more resources and knowledge bases for building than ever before. Between sites like Anandtech, Tom’s Hardware and online communities like /r/buildapc and /r/techsupport, you’re never going in blind. There are instructional videos everywhere that explain and guide every part of the process (some sources here); and the videos are produced by all kinds of entities, including hardware companies, retailers, and end-user enthusiasts. You should have no problem finding an answer to any question you might have. We hope these reasons are enough to convince everyone to build their own PC. If you have a hesitant friend, or if you were wondering about the advantages of building your own PC, or if you have already built your own PC and were looking for a list to inflate the ego even further, hopefully this helps. Follow Logical Increments on Facebook and Twitter for updates and Steam game giveaways.